On the afternoon of December 13, the Shanghai Expeditionary Force Headquarters at Tangshuizhen was ambushed by Chinese stragglers. The Japanese repelled them, but they attacked again around 5:00 p.m. Then, according to Major-General Iinuma's war journal, "a free-for-all ensued." 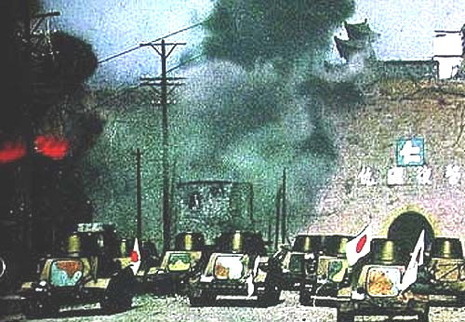 On December 13, the Japanese Army completed the encirclement of the city. The 6th and 114th Divisions of the Japanese Army were the first to enter the city. 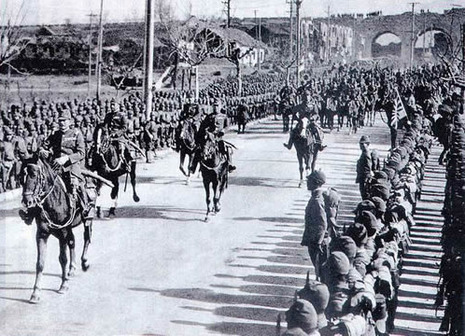 At the same time, the 9th Division entered via the nearby Guanghua Gate, and the 16th Division entered via the Zhongshan and the Taiping Gate. That same afternoon, two small Japanese Navy fleets arrived on both sides of the Yangtze River. Nanking fell to the Japanese by nightfall. Despite Chiang Kai-shek's support and protection, Tang was blamed for the failure to defend Nanking which resulted in the consequent Nanjing Massacre. In the morning of 13 Dec, men of the Japanese 6th and 114th Divisions entered the city, followed by the men of the 9th (via Guanghua Gate) and 16th (via Zhongshan and Taiping Gates) Divisions; these four divisions numbered about 50,000 men. That afternoon, two small Japanese river flotillas arrived at Nanjing's ports. By nightfall, the Japanese had declared the battle a victory.